The Mackintosh course, is named after Alfred Donald Mackintosh of Mackintosh the 28th Chief of Clan Mackintosh and Chief of Clan Chattan, who resided at Cottrell during the 19th and 20th Centuries. The course provides 6,407 challenging yards off the white tees and has been designed around the original features of the rolling parkland, including a Roman Motte. This championship course has been selected for a number of Welsh Golf Union and Welsh Ladies Golf Union events as well as County Matches, which is indeed a compliment to a course so young. 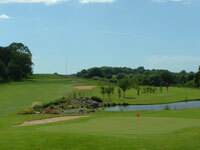 The Mackintosh course will test golfers of all standards to the best of their abilities.